Guess who shelled out $10 at the ole HEB for a Wacky Wild Bakugan Battle Brawlers slip-n-slide?! This guy! Most people I ask feel that this is a fairly bad idea. That adults were not meant to hurl their bodies at wet tarps on the ground. But to them I say, Good Day! I’m excited. The glorious waterslide will be unfurled on Memorial Day. Stay tuned for a full report. 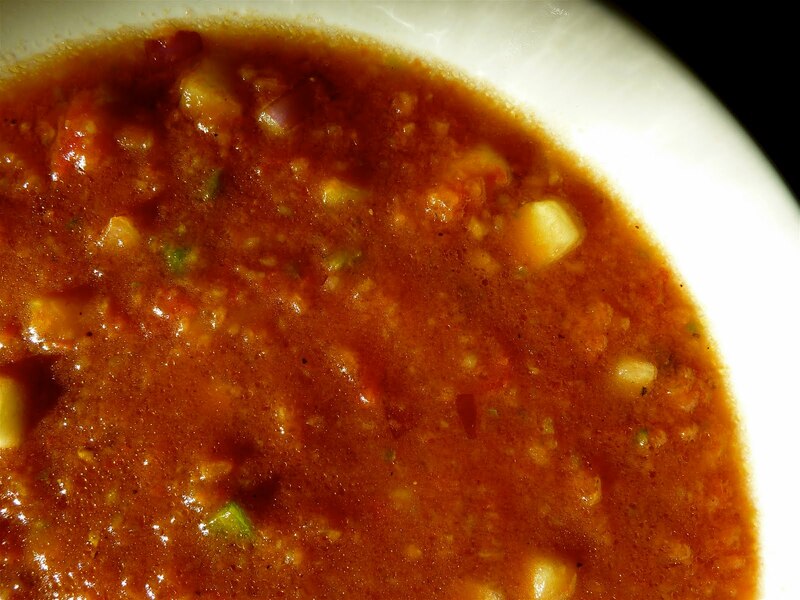 Why do I share this with you now, in my post about gazpacho? Because, dear reader, it is quintessentially summery! No dish speaks more of summer to me than my mom’s gazpacho. I have tried so many varieties of this dish (Most recently: Martha Stewart’s. Most disgustingly: Opal Divine’s. Egads it was terrible- like a jar of Pace salsa thickened with cornstarch and sweetened with Equal), and none come close to this one. This is fresh and bright, and has the perfect consistency for me (half of the vegetables are pureed, half are left in a small dice). And happily, we’ll soon be able to make a batch using Helen‘s tomatoes, which are coloring up nicely! Rub the inside of a large serving bowl with the smashed garlic clove. Put each of the remaining ingredients in the bowl and stir to combine. Transfer half of the gazpacho mixture to a food processor and process until smooth. Pour the processed mixture back into the serving bowl and stir to combine with the unprocessed vegetables. You’re done! I will be trying this recipe out, for sure, sneaking in avacado after I've tasted it in it's intended state! As for the slip-n-die, my father threw his back out on one at my birthday party, two years in a row when I was a kid. Be warned, scout for twigs and rocks all around it's intended location, 'cause those will kill. hooray! thanks, brekken! there is precious little in this world that is not improved by avocado. also, thanks for the tips about the slip-n-slide- i will be sure to head your warnings! Yum – one of my favorites; maybe I'll make a batch tonight if I can bring myself to swim through the fog to the grocery store. Do you have a strong opinion on food-processing – I've always been very against it, preferring an all-chunky soup, but maybe it's worth it to zap a little and try it. I don't like all-smooth gazpacho nearly as much. Does meeting halfway make a big difference? Also, my secret weapon in gazpacho is mint. tons of it, chopped/shredded. I love it. And I use sherry vinegar rather than lemon juice but I suspect that makes less of a difference. In side news, where has this blog been all my life. (I guess it's been here, where have I been?) Great stuff on here. You have inspired me to go home and make gazpacho, as well as get some extra cucumbers to soak in ice water like they had in the lobby of the convention hotel. Sigh, I need to cook more.